Drawing national conclusions from a state election can be a difficult task, especially from a contest in which sporting stadiums was the major issue of debate. And yet, given New South Wales is the most populous state in Australia, those currently prepping for the Federal election in May will have been watching Saturday’s election closely. So, what can they reasonably learn? After a disappointing result in November's Victorian state election, from the point of view of the Prime Minister Scott Morrison, it may be very tempting to read the NSW result as sign that things are turning around. The NSW Coalition has just secured it third straight victory, even though each has been under a different leader (somewhat reflecting the situation the Prime Minister Scott Morrison finds himself in). While pre-election polls suggested a very close election, it now seems most likely that Berejiklian will lead a majority government, with 47 or 48 of the 93 seats in the Legislative Assembly. However, any post-election boost in confidence is more likely to be a false dawn for the federal Coalition. Good economic conditions in NSW, and the electorate’s natural tendency towards the status quo, should have made Berejiklian’s victory fairly predictable. Moreover, the extent to which the last weeks of the campaign focused on government response to climate change should provide an added degree of concern. Aside from the campaign period, elections are partly determined by broad factors that provide a much more stable and predictable backdrop to a campaign. Foremost among these are macroeconomic conditions. In an analysis of 191 state elections between 1916 and 2006, Andrew Leigh and Mark McLeish found that each additional percentage of point of unemployment reduces the incumbent’s probability of re-election by 3-5 percent. Unemployment in NSW is currently at 3.9 percent, the lowest since at least 1978, when official records begin. Leigh and McLeish found that of those 127 State or Territory elections in which the incumbent government retained power, mean unemployment was 4.8 percent, well above the current figure in NSW. Of course, unemployment is not the only measure of economic conditions. Nor are economic conditions the only determining factor. However, Leigh and McCleish also find that Australian voters consistently demonstrate status quo bias. Of the 191 elections in their database, 127 resulted in the re-election of the incumbent government. With no major scandals (and, in fact, lingering corruption scandals from previous Labor governments), and with a new and not especially popular opposition leader (who followed two previous not especially popular opposition leaders), it shouldn’t be surprising that the status quo was acceptable for enough voters. However, even with record-low unemployment, the Coalition’s victory in NSW was narrow. Once all seats are decided, it is likely to have lost in the order of six or seven seats. Their national counterparts have no such margin for error. Moreover, economic conditions are more uncertain nationally than they are in NSW. While the transition from Mike Baird to Gladys Berejiklian in January 2017 was smooth, leadership changes in Canberra have been anything but. Federal Labor leader Bill Shorten, while not exactly popular, is the known quantity. Furthermore, the NSW government has been able to point to significant investment in infrastructure. Their federal colleagues have been stymied by internal fragmentation on key issues and the Senate cross-bench. In short, there is good reason why punters favoured Berejiklian, yet continue to have Shorten as an almost unbackable favourite. While macroeconomic conditions will certainly be important in the May election, we can also gain a sense of the likely salience of several other issues by looking closely at the degree of attention given to them in the NSW campaign. Here, I do so by tracking mentions of key issues in articles in the two major Sydney newspapers, the Daily Telegraph and the Sydney Morning Herald. 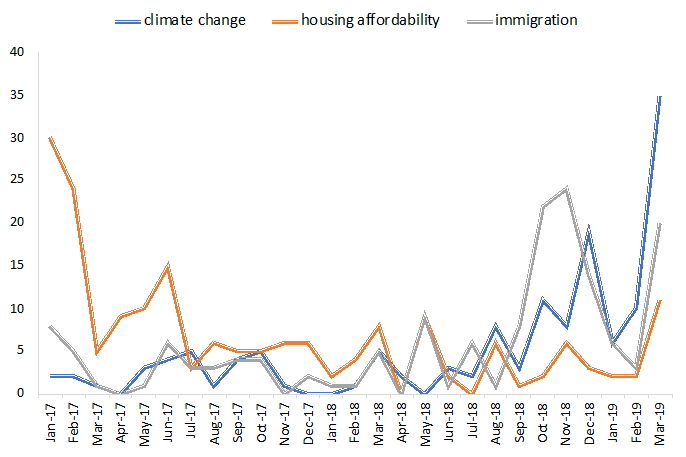 As shown in the chart below, I have chosen three issues that have been both the subject of debate in NSW politics and that will also likely be of interest during the federal election: climate change, housing affordability and immigration. This search presents several interesting findings. Upon becoming Premier in January 2017, Berejiklian declared that housing was “the biggest issue people have across the state”. However, with significant falls in Sydney housing prices during 2018 and early 2019, housing affordability does not appear to have been a key focus during the election. Similarly, in October of last year, Berejiklian ignited debate about population policy by calling for a return to Howard-era levels of immigration. However, perhaps influenced by the failure of the immigration-focused campaign in Victoria last year, Berejiklian appears to have largely stayed away from the issue during 2019. While there is a small uptick in articles mentioning immigration, this is largely due comments made by the opposition leader in the final week of the campaign. However, this trend is reversed when it comes to climate change. While climate had previously not been the subject of much attention during Berejiklian’s term as Premier, this appears have changed rapidly in the lead-up to the election, especially in the last few weeks of campaigning. Given that the Coalition’s approach to environmental policy has been consistently less popular than Labor’s, focus on climate, rather than immigration, would be another bad omen for the federal Coalition Government. Powered by the Melbourne School of Government at the University of Melbourne.